residents who are serving our country in the military. Ranks will be updated as submitted. 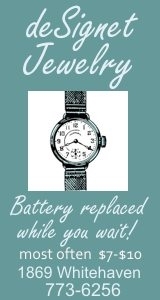 Submit Island service people or corrections to teddy@giecom.net. Thomas Shanor, a GIHS Class of 2009, graduated from the United States Marine Corp in July 2010. He received a meritorious promotion to PFC for hig shooter for the company. Pfc Shanor is beginning a year-long schooling in Pensacola, FL. to become an Aircrew/Flight Mechanic. 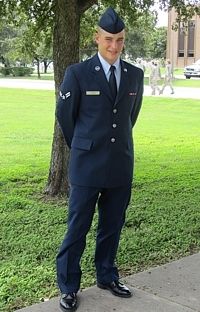 October 7, 2010 . . .Anthony M, Gugino graduated from the Air Force Basic Military Training, Lackland Air Force Base, Texas on September 23, 2010. He received a Fitness Excellence Award, Thunderbolt level. Anthony is continuing his training at Sheppard Air Force Base also in Texas. 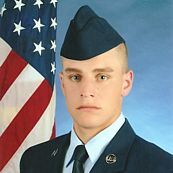 The Airman is a member of the Grand Island High School Class of 2009. Sept. 23, 2010 . . . LCpl Michael Magaris, serving with the United States Marines, was Meritoriously promoted to LCpl on March 1, 2010. Mike, son of Linda and Robert Magaris, deployed to Afghanistan on Sept. 16, 2010. Sept. 1, 2010, 2010 . . . Brent Helman was promoted to the rank of Technical Sergeant in the United States Air Force on July1, 2010. TSgt Helman is currently stationed at Vandenberg AFB, CA. 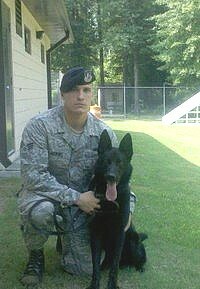 July 1, 2010 . . .SRA Brian Judkins USAF - Security Forces K9 unit, will be promoted to SSgt Brian Judkins on July 1, 2010. He is currently assigned to Warner Robbins, Georgia, and preparing for his second deployment to Iraq in October with his K9 dog Fero. June 17, 2010 . . . David J. Conboy will be promoted to Brigadier General on 19 June at the Buffalo Launch Club, Grand Island, NY. MG James B. Mallory III, former commander of the 108th Training Command, Charlotte, NC, and BG Robert G. Catalanotti, Program Manager, Facilities Security Forces, Riyadh, Kingdom of Saudi Arabia, will be the presiding officers. Family, friends and colleagues will be present to congratulate BG Conboy as he ascends to Flag Officer rank in the United States Army in a ceremony steeped in military tradition. BG Conboy serves as the Wartime Deputy Commanding General for Support for the Eighth United States Army. In this capacity he oversees army sustainment operations in Korea to ensure that the Eighth U.S. Army can fully support the United Nations Command�s mission to deter, and if necessary defeat, North Korean aggression against the Republic of Korea. BG Conboy previously served as the Deputy Program Manager, Office of the Program Manager, Facilities Security Forces in the Kingdom of Saudi Arabia, and as the advisor to the Deputy Chief of Staff of the Iraqi Joint Forces. 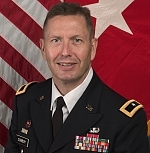 He has held numerous command and staff positions in the 98th Division (Initial Entry Training), including Battalion and Brigade Commander, Deputy Chief of Staff and Deputy Commanding General. On active duty, BG Conboy served with the 39th Engineer Battalion, Fort Devens, MA as Resident Engineer at Thule Air Base, Greenland; and with the Buffalo District, U.S. Army Corps of Engineers. BG Conboy is a graduate of the U.S. Army Airborne School, the Engineer Officer Basic and Advanced Courses, the Combined Arms Services Staff School, the Command and General Staff College, and the U.S. Army War College. 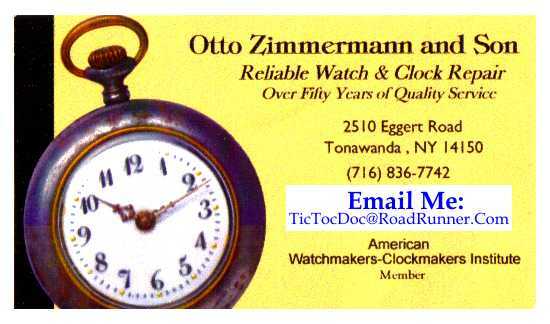 He holds a Bachelor of Science Degree in Mechanical Engineering from the University of Notre Dame, a Masters Degree in Environmental Engineering from the University at Buffalo, and a Masters Degree in Strategic Studies from the U.S. Army War College. BG Conboy is also a licensed Professional Engineer and a certified Project Management Professional. BG Conboy's awards and decorations include the Bronze Star Medal, Meritorious Service Medal, Joint Services Commendation Medal, Army Commendation Medal, Iraq Service Medal, and the Global War on Terror Expeditionary Medal. BG Conboy's civilian position is with the Buffalo District U.S Army Corps of Engineers as the Chief of the Technical Services Division. He deployed to Iraq as a civilian to oversee the reconstruction of the Oil Infrastructure throughout Southern Iraq. He currently is deployed to the Kingdom of Saudi Arabia, serving as the Chief of Staff, Office of the Program Manager, Facilities Security Forces, assisting the Program Manager in providing advice and assistance to our Saudi partners on critical infrastructure protection. BG Conboy is a long time resident of Grand Island with his wife Karen (Lunsford), daughter Sarah McMahon, a Captain in the U.S. Army Reserves, son David, a Sophomore at St Joseph's Collegiate Institute, two year old daughter Clare and three year old granddaughter Hailey. 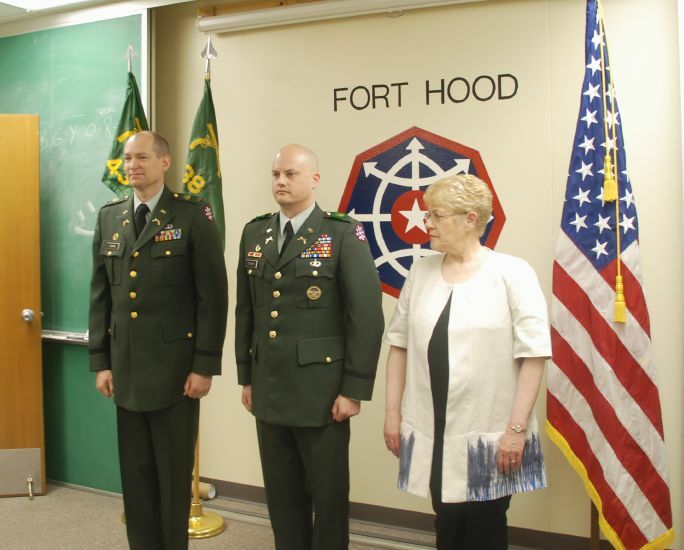 BG Conboy is Vice President of the Neighbor's Foundation of Grand Island, a member of the Veterans of Foreign Wars and the Knights of Columbus, and with his Family, parishioners at St. Stephens Roman Catholic Church. June 3, 2010 . . . Lt Col Christopher T. Ford is back on US soil after 11 months + in Iraq. He will continue his U. S. Air Force career in the United States. May 20, 2010 . . . Michelle L. (Elmer) Dargan was recently promoted to TSgt in the U.S. Air National Guard. She has been proudly serving for ten years. 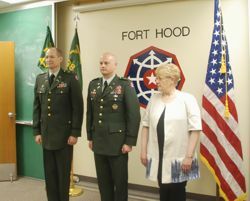 Shown from left are CW5 Steve Downs, operations Officer 11th Military Police Battalion (CID); CW4 William J. Tokash Jr. and his mother, Sharon Tokash. May 6, 2010 . . .CW4 Special Agent-in-Charge William J. Tokash Jr., U. S. Army, was promoted to Chief Warrant Officer 4 on April 30, 2010. Bill, a member of the Grand Island High School Class of 1987, joined the Army in 1992, He has served in Iraq, and was the recipient of a Bronze Star Medal in 2004, "For exceptionally meritorious achievement while assigned as a personal security officer for the Director, Office of Reconstruction and Humanitarian Assistance in support of Operation Iraqi Freedom." Bill has had many state side duty stations during his 18-year career including duty at the Pentagon, Ft Campbell, KY and his current duty station at Ft. Hood, TX. Bill is the son of Sharon Tokash of Grand Island and William Tokash, Sr. of Amherst. Apr. 22, 2010 . . .DC2(SW) Ryanne K Clingersmith, born and raised on Grand Island, is currently on deployment in the Horn of Africa conducting Anti-Piracy Operations. She is a graduate of Grand Island High School, Class of 2003. 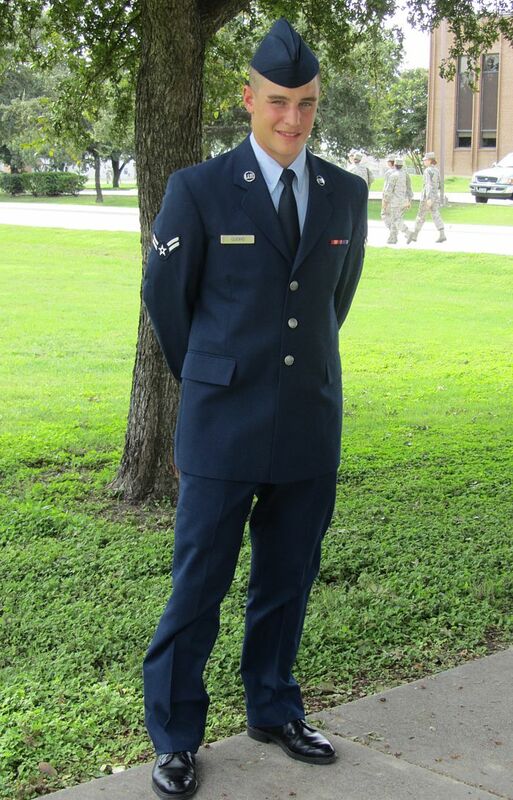 Richard Vanthoff has graduated from Air Force BMT at Lackland Air Force Base, TX. He is continuing his training at Fort Sheppard, TX and Little Rock, Arkansas for Crew Chief Technical School. Pvt. 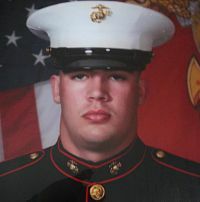 Anthony J Guenther graduated from the United States Marines boot camp, Parris Island, South Carolina, on February 26, 2010. AJ traveled to Parris Island on December 1, 2009 for 12 weeks of training after graduating from Grand Island High School June 2009. He came home February 27th for a 10-day leave and will be be sent to Geiger, North Carolina for four weeks of combat training. Following that he will be in Pensacola, Florida for the next year for school/training for his job as a Aircraft Carrier mechanic. Feb. 18, 2010 . . . SSgt Matthew Fox from the 107th Airlift Wing was promoted to Technical Sergeant as of 24 January 2010. Feb. 11, 2010 . . . On 14 January, 2010 Staff Sergeant Brent M. Helman was named the 30th Security Forces NCO of the year. SSgt Helman is currently assigned to Vandenberg Air Force Base as the Non-Commissioned Officer In Charge of Installation Security North Base. Feb. 11, 2010 . . .Sgt Joshua Gerace, a member of the United States Marine Corps, was promoted to Sgt/USMC on February 1, 2010. Feb. 4, 2010 . . .SSgt Andrew Golembiewski, a member of the United States Air Force, has been stationed overseas in England for the past 3 years. Pfc. Michael Magaris, son of Robert and Linda Magaris, recently completed basic training at Marine Corps Recruit Depot, Parris Island, SC. Mike successfull completed 12 weeks of training designed to challenge new Marine recruits both physically and mentally. Mike and his fellow recruits began their training each day at 5 a.m., by running three miles and performing calisthenics. In addition to the physical conditioning program, Mike spent numerous hours in classroom and field assignments, which included learning first aid, uniform regulations, combat water survival, marksmanship, hand-to-hand combat and assorted weapons training. They performed close order drill and operated as a small infantry unit during field training. Mike also received instructions on the Marine Corps' core values, guiding personal and professional conduct. Mike and fellow recruits ended the training phase with the Crucible, a 54 hour team effort and problem solving evolution. After graduation from Parris Island, he will be stationed at Ft. Lejeune, NC for 29 days of combat training. He will then begin additional training at Fort Lee in Virginia for Bulk Fuel Specialist. 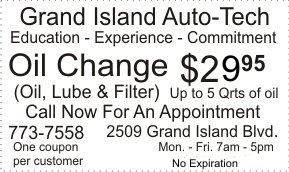 Michael is a 2008 graduate of Grand Island High School.